A team of researchers from the University of California, Harvard University and The Pennsylvania State University has found a simple approach to getting a robot to change planes when running into a wall—follow the example of the cockroach—it just headbutts the wall its physical shape causes it to start climbing upwards. The researchers have published a paper on their robot design in Journal of the Royal Society Interface. To maneuver around in the real world on their own, robots have computer brains and a lot of code, but sometimes, the researchers with this new effort found, it is easier to rely on a more simplistic approach. The cockroach does not do much thinking when it is skittering across a floor and meets a wall—it simply slams headfirst into the wall, and the shape of its body carries its head and upper body upward, while its legs keep churning. This approach allows roaches to change planes without processing, and it just keeps on running, right up the wall. It happens quickly, in as little as 75 milliseconds. In designing a robot capable of climbing a wall, some thought must be given to the transition from floor to wall—a process that could take hardware and a lot of code if it is broken down into steps. But the researchers wondered if they could design a robot with the shape of a cockroach that could slam into the wall headfirst. To find out, they filmed cockroaches in their lab slamming into walls and climbing upwards, then set to work designing a robot mimicking what they found. They settled on a simple boxlike design—a small, very light robot that fits in the palm of a hand, with a cone-shaped snout and six legs that keep on pushing forward regardless of what happens. They ran several trials to fine-tune their creation and then filmed the results—a very simple robot able to shift from a level stance, to facing directly upward at a 90-degree transition without any computer processing by simply running into a wall. The little robot is not able to climb a wall yet, but it is able to carry out the transition without the need for additional hardware or software, which is a vital step in the process. Exceptional performance is often considered to be elegant and free of 'errors' or missteps. During the most extreme escape behaviours, neural control can approach or exceed its operating limits in response time and bandwidth. Here we show that small, rapid running cockroaches with robust exoskeletons select head-on collisions with obstacles to maintain the fastest escape speeds possible to transition up a vertical wall. Instead of avoidance, animals use their passive body shape and compliance to negotiate challenging environments. 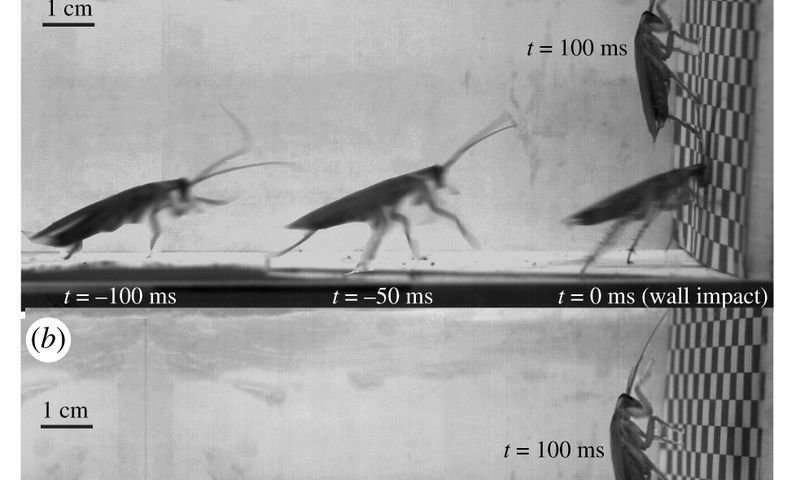 Cockroaches running at over 1 m or 50 body lengths per second transition from the floor to a vertical wall within 75 ms by using their head like an automobile bumper, mechanically mediating the manoeuvre. Inspired by the animal's behaviour, we demonstrate a passive, high-speed, mechanically mediated vertical transitions with a small, palm-sized legged robot. By creating a collision model for animal and human materials, we suggest a size dependence favouring mechanical mediation below 1 kg that we term the 'Haldane limit'. Relying on the mechanical control offered by soft exoskeletons represents a paradigm shift for understanding the control of small animals and the next generation of running, climbing and flying robots where the use of the body can off-load the demand for rapid sensing and actuation.